June 2002 – With the help of TAM, Jimmy Rodriguez earned his first B since 8th grade, and enrolled in John Muir Charter School to earn his high school diploma. In June 2004, 13-year-old Aviation Explorer, Breean Farfan from Bellflower, completed a cross-country flight with an FAA Certified Flight Instructor Devin Reed. Breean flew from Compton, CA to Oshkosh, WI to attend a four-day aviation camp. Breean’s roundtrip covered 3,671 nautical miles, and included stops in Arizona, Colorado, and Nebraska. In September 2004, 11-year-old Jimmy Haywood and 14-year-old Kenny Roy, Aviation Explorers from Compton, set world records. 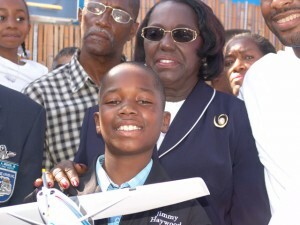 Jimmy became the youngest African-American male to fly an airplane on an International round-trip and Kenny became the youngest to solo an airplane. Kenny, supervised by a Certified Flight Instructor, flew a Cessna airplane to Canada where he earned his license to fly solo. In Canada, the age requirement to fly solo is 14, as opposed to 16 in the U.S.A. Press and family welcomed the two young pilots from their return flight to the Compton Air Fair.January 2005 – Partnered with Compton Unified School District Regional Occupation Program. TAM students participated in Avionics CAD/CAM class, and one graduate, Adam Ifill, was placed at a Boeing internship. On September 22nd, 2005, TAM participated in the Congressional Black Caucus Convention in Washington DC. 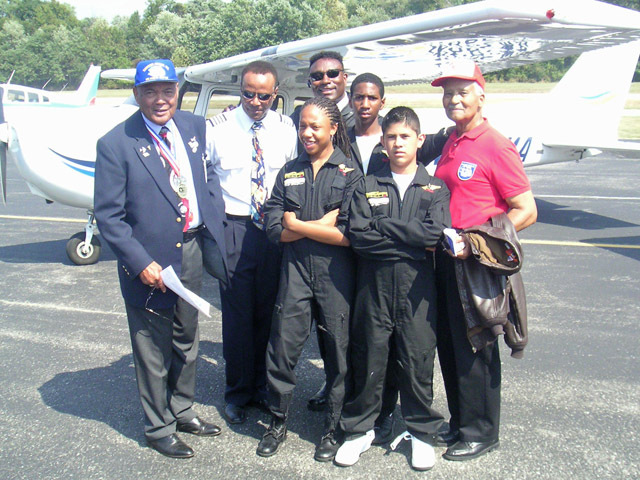 Three young Aviation Explorers, Diamond Hooper, Richard Olmos, and Kenny Roy, competed in the first “youth versus military” precision flying competition demonstration at College Park Airport, where airplane inventors Orville and Wilbur Wright first began giving flying lessons. 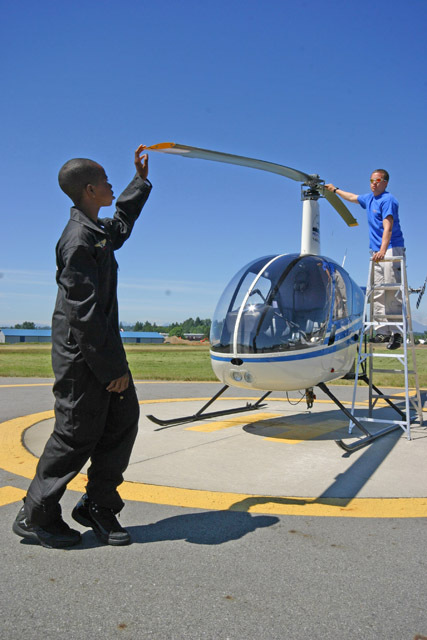 June 2006, 14-year-old Aviation Explorer from Inglewood, Jonathan Strickland, made aviation history by becoming the youngest to solo an airplane and a helicopter on the same day. To accomplish this goal, he had to travel to Canada. The trip earned Jonathan three other world records: the youngest African-American to solo a helicopter; the youngest African-American to fly a helicopter internationally; and the youngest African-American to fly a helicopter on an International round-trip. 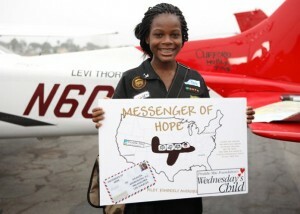 In 2008, on her 16th birthday, Kelly Anyadike made her way into the Guinness Book of world Records by being the youngest African-American female to solo in four different fixed-wing aircraft on the same day. 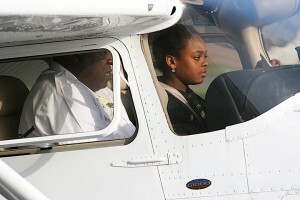 In July 2009, Kelly’s younger sister Kimberly Anyadike made aviation history by becoming the youngest African-American female to pilot an airplane transcontinental when she flew with a safety pilot and 86 year-old Tuskegee Airman Levi Thornhill “from sea-to-shining-sea” from Compton, CA to Newport News, VA and back. In September 2009, Kimberly and Kelly Anyadike were invited by California Governor Schwarzenegger to the State Capitol to be honored for their achievements on both the Senate and Assembly floors. Kelly is a Junior at Biola University. Kimberly was named top 25 Most Influential People by ESSENCE MAGAZINE, a SEVENTEEN MAGAZINE Pretty Amazing Finalist and a Freshman at the University of California Los Angeles. My name is MacArthur Dandridge. I’m sixteen years old. I started coming to TAM when I was six years old. I’m a helicopter and airplane pilot. When I first came to TAM I was scared to fly. One day Robin bet me $50.00 to get 5 feet off the ground. Now, to this day, I am not scared to fly. I come to TAM to stay off the streets. TAM is the best place to be. Hi! 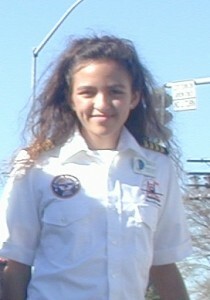 My name is Danyale Denise Dotson and I am a member at Tomorrow’s Aeronautical Museum, also known as TAM. My first time coming to TAM was when I was in the 7th grade and I had come with my friend Kyra who was currently enrolled in the program. My mother and I live across the street from TAM on Grandee Avenue, we moved there October 3, 2011. During the summer of the year 2011, I decided to join TAM’s flying program, known as Flight Class and my flight teacher was Isaac. My reason for coming to TAM again after 2 tears was because my boyfriend had kept on asking me to go with him but I kept telling him no because I was shy since I hadn’t been there in so long. My purpose in joining TAM’s flying program was to learn about how to fly, I wanted to learn about flying because it is a beautiful talent and it is also a great way to travel. I love being at TAM because I love meeting new people, eating snacks during my Youth Leadership Council meeting (I am the Secretary) and going on field trips. My name is Daniel Kinzy and I started coming to TAM 10 years ago when I graduated from elementary school. All of my friends started coming here so I said, “Hey that sounds fun, I want to go.” And I did. Now, when I first started coming to TAM, I was getting into a lot of trouble as a child and I wasn’t that much into flying, but as I started coming I figured, why get into trouble when I could learn to fly and this can be a place to have fun after school. TAM works out for me. TAM has helped me a lot through my struggles at home and at school. If I didn’t want to be at home, I could come to TAM as a safe haven. As for school, if I was having problems with homework or any subject, there would be someone there to help me. As I’ve gotten older, the people at TAM have become like family to me. In 2003, I began my journey toward the career of my dreams. The venue is Tomorrow’s Aeronautical Museum. It’s a facility that is dedicated to helping the youth achieve greatness in the aviation industry. That youth includes myself. My name is Brian Monette and I am a commercial pilot. I was 18 years young when I began my flight training. It began with me trying to just have a little fun but little did I know that I was to endure upon a thrilling journey of a lifetime. The Aviation Explorer program was the vehicle that took me to my goals in aviation. I worked very weekday afterschool towards my Private Pilot license. paid no “out of pocket” expense towards my license which is a huge accomplishment. In 2007 I obtained my Commercial Pilot license and was immediately hired to be a sightseeing tour pilot. Till this day I am a pilot for TAM/Celebrity Helicopters and will always be around to give my support. My goal is to become a corporate pilot or an airline captain. That goal is extremely close to me, I can almost taste it. Just this past January I received my multi-engine license that will allow me to fly airplanes with more than one engine. Through TAM I have met many pilots and entrepreneurs. Many of them I remain in contact with to this day. I am currently job searching for anything available as far as flying. I’m also pursuing my flight instructor’s license so that I can pass on my knowledge to the next young aspiring pilots. From living and growing up in the streets of Compton to flying over the entire city of Los Angeles and I’m not done yet. All of this was possible because of TAM and the founder Robin Petgrave who has been a great mentor since I started working there years back.